How to Un-Product Place your Commercials & Branded Content. A Case Study On Removing Logos and Licensed Images from Productions. For a recent project, we had to take a bit of a different approach to the idea of making sure a final commercial didn't feature any logos or licensed images. Our client, Go RVing, is responsible for marketing all the positive aspects of traveling in an RV. One of those obvious scenarios where RVs enhance the experience for all involved is in tailgating for sporting events. Go RVing wanted to move towards real stories that feel authentic to viewers and potential RVers. 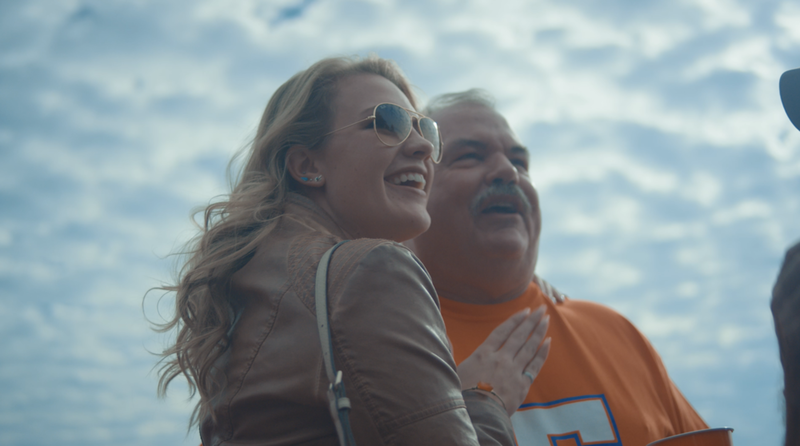 After briefly exploring NFL tailgating scenarios, and exploring the costs associated with hiring 30-50 main and extra talent to appear on camera, we landed on this scenario: what if we featured real people at an actual college football tailgate at a big-time school? Instead of spending the money on the front end hiring art department, spending the money on props, hiring talent who we would need to wardrobe and could control, but which would lend a sense of commercial inauthenticity, why not feature a REAL tailgate with REAL friends? The expense here would be on the post-production side; we would need to remove all logos involved. We knew we could do this, but would just need the help of the expert compositing and visual FX folks at The Colonie in downtown Chicago. Smoke artist Tom Dernulc has been cleaning up the occasional logo for us, and other big brands, for years. But this would be one project that featured far more challenges than what we were used to sending him. How did he do in response? See how he removed logos, brands and licensed images from Go RVing's Tailgating Adventure video below! The moral of the story? If you're producing a commercial or digital content that may feature images that could potentially be a legal problem for you or your client, you should consider your options. Is it more worthwhile to pay for art department, props, talent, and the associated crew that comes with wrangling those factors? Or do you want to enter into more of a flow where you don't worry about logos and licensed images until the post-production side of the production process? The good news? Either decision works, and our process worked out well for our client. The next time you get into a scenario where your commercial production needs problematic images removed, there are amazing digital compositing experts like our friends at The Colonie who can simply erase your issues away! Watch "Tailgating" in full speed without any logos below!